Join acclaimed speaker and spiritual director Fr. 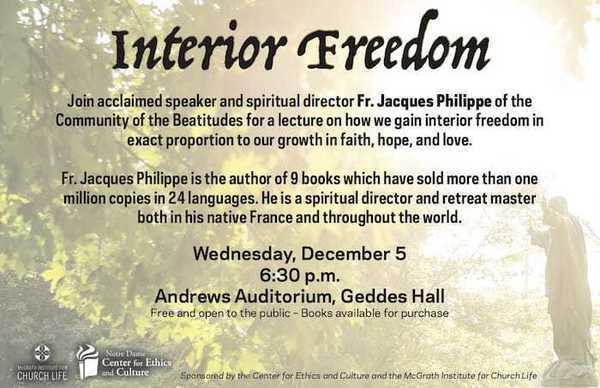 Jacques Philippe of the Community of the Beatitudes for a lecture on how we gain interior freedom in exact proportion to our growth in faith, hope, and love. Fr. Jacques Philippe is the author of nine books which have sold more than one million copies in 24 languages. He is a spiritual director and retreat master both in his native France and throughout the world. Lecture is free and open to the public. Books will be available for purchase before and after the lecture. Cosponsored by the Center for Ethics and Culture and the McGrath Institute for Church Life.